They were fighting for the opportunity to take their team to a Queen’s Cup final and then onto the U Sports National Championship. The only thing standing in their way: Goliath. McGill had spent the season atop the division as favourites for the Queen’s Cup, and with good reason. Their relentless offense, a stingy defense and good goaltending made them a force to be reckoned with. In the first 10 minutes of game one, it really did look like David versus Goliath. “They were all over us,” said Concordia defender Mathieu Desautels. Related: Concordia Takes Game One Over McGill. Concordia was being outshot and could barely get the puck past the skilled McGill defense, and simply looked outmatched. In that 10 minutes, Concordia bent, but they didn’t break. Quickly, though, as if a switch had flipped, the game turned in favour of the Stingers. A late goal from forward Raphael Lafontaine and some goaltending heroics from game one hero Marc-Antoine Turcotte propelled the team into the second frame. There, they found what would be a game-winner courtesy of Charles-Eric Legare. In the end, it meant a win. A win that put them just one game away from battling it out for the Ontario University Athletics’ top prize, taking a team that many didn’t expect much from and coming out with a championship. To get where the team is now and earn a win against McGill takes something special. That’s how it’s been this playoff season. Concordia has been winning games with smart defensive play and offense coming from across the lineup. 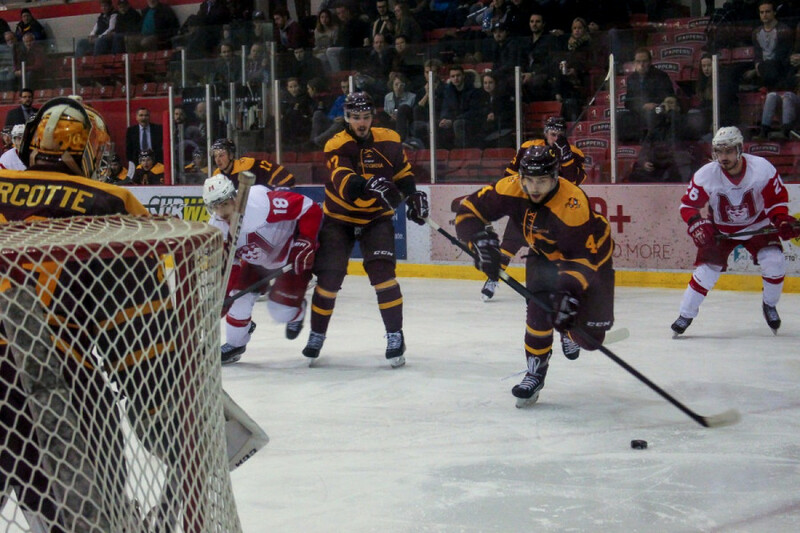 Related: Concordia and McGill Set For High-Stakes Clash in Playoffs. Yet it’s neither of Hudon’s linemates leading the team with eight points in just six games. It’s the team’s captain that has been a force during these playoffs, adding an empty netter at the end of the game to seal the victory for Concordia. Then there’s Lafontaine, who not only scored the first goal of the game but moved up and down the lineup all night to protect the Stingers’ lead. Lafontaine not only turned the tide of the game with his goal, but spent the game containing a McGill offense that scored an average of four goals a game—good for fourth in the country. To round out Concordia’s scorers, there’s Legare. Like Lafontaine, his penalty killing was a major asset in stopping McGill’s offense dead in its’ tracks. McGill went to the numerical advantage went to work four times against Concordia and was frustrated each and every time. 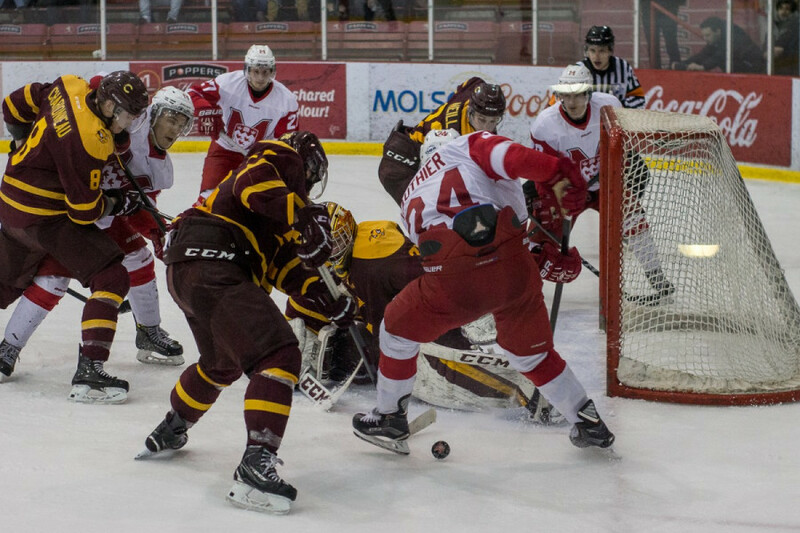 On top of this, Legare’s game winning goal was part of an offense that broke through the wall that is McGill goalie Louis-Philippe Guindon. Coming into the series, Guindon was riding a .939 save percentage and had looked nearly unbeatable. Yet the Stingers managed a goal on their second shot of the game and a win with just 18 shots against the star netminder. It was Concordia’s goaltending that shined in the rivalry matchup. The game’s undisputed first star was goaltender Turcotte. “He was the best player on the ice,” said head coach Marc André Element. Turcotte, who returned from an injury suffered less than a week ago to play the final game of Concordia’s round two series, knocked aside 43 shots, allowing only one goal that came in the final minute of play when McGill brought in an extra attacker with their goalie pulled. Related: Stingers Eliminate Queen’s After Tense Three-Game Series. “He’s unbelievable. He’s such a key player on the team. We wouldn’t be here without him,” said Desautels of his goaltender, who kept Concordia in the game with a first period performance for the ages. Turcotte has perhaps been the Stingers most valuable player in these playoffs. In moments when the team has faltered or needed more time to come together, it is Turcotte that has shut down opponents without question. He has yet to allow more than two goals in a single playoff game and is undefeated on the road. The reason that Concordia is in this historic position is that they have been able to lean on their roster. From their stars to their depth players, every player is contributing to this run and exceeding expectations. “With the people that we have, we gotta put everything in the same basket and just push and push and push,” said Hudon. It was an exciting start to the crosstown battle. With the division title, a Queen’s Cup finals berth and a trip to nationals on the line, it should only become more intense. Game two takes place Saturday, 7:30 p.m. at Ed Meagher Arena.